1 teaspoon each dried basil, 1 rosemary, 1 sage and 1 thyme. 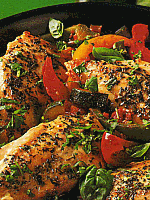 Brush the herbs onto the chicken fillets so that they are infused with the flavors. Place tomatoes in a large bowl and pour boiling water over them. Leave until the skins split, then drain, run under cold water and peel off the skins. They are now ready to be chopped. Another option is to use the same equivalent of canned tomatoes. Heat 2 tablespoons of oil in a large frying pan. Add chicken and fry for 8 minutes. Turn over and fry for another 5 minutes. Remove from pan and keep warm. Add the remaining oil, onions, garlic, zucchini and capsicums to the frying pan. Stir continuously for about 10 minutes until the vegetables become soft. Add the tomatoes including the juice and season with salt and pepper. Stir in the parsley and place chicken on top. Cover and simmer for a further 10 minutes. Garnish with basil and serve with or without rice.